MINT Gym + Nutrition | POOP Health - whats normal & whats not? It is the bodies way of telling us if our food is getting digested and absorbed correctly, and is there a reason why the digestion isn’t working well. We can get more information by finding out about what happens when they have a bowel motion. So many people have no idea what is a normal, and thinking that their abnormal bowel motions are normal and put up with chronic gut issues. The Bristol stool chart is a great tool that I use in clinic, and to get clients to start looking and taking note of their stools. The stools are numbered as types, and there is an ideal type. Type 3-5 is normal. Type 4 is perfect, for the first bowel movement and then Type 5 for the 2nd or 3rd movement of the day. Type 1 and Type 2 indicate constipation and a longer transit time. This means our food, toxins, old hormones and old cholesterol is not getting removed well, and gets a chance to stay in our bodies instead of getting cleared out. 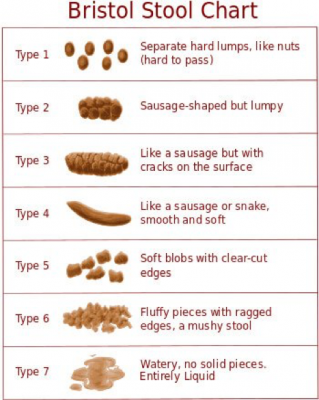 Type 6-7: considered abnormal and indicate diarrhoea. The transit time of these stools is too fast and therefore the ability of absorption is inhibited. These stools may require further investigating to rule out any pathogens or food intolerances. This can vary but most experts agree that it’s important to go to the bathroom at least three or more times per week at a minimum. I think a daily movement is normal – and for some people going 2 – or three times a day is normal. It is important that these stools are regular in what they look like, using the stool chart above, and then looking at the colour, the smell, and what it feels like while passing the stool. What does it feel like to pass a normal stool? Passing a bowel movement should be easy, not requiring a lot of pushing. You should feel fully evacuated, and that you have cleared your bowels. Should be a brown colour. If you find your stools are yellow, green, black or pale clay colour -then this is indicative that you have issues. This can range from pathogens, poor fat absorption, inflammation, or internal bleeding. Some foods can cause them to discolour – for example eating beetroot can cause a red tinge to your stools. Your stools smell because of the toxins being removed from your body, as well as the bacteria involved in the gut lining. If you notice a change to the smell that is offensive, and continues for several days, then it may need to further investigation. When your bowel movements are abnormal, then it is important to work out what is the cause. Doing a food diary and monitoring your bowels and digestive symptoms is an easy way to identifying any food intolerances or allergies. It also helps identify any other triggers such as, stress, low water intake, low fibre intake or lack of exercise. If you make these changes and still have no improvement, then we need to dig deeper, and look at what testing will give us the best answers. This can include stool samples, blood testing, allergy testing, and breath testing for gut dysbiosis. Getting your gut health working well, is paramount to good health, and preventing many diseases. If you are concerned about your bowels, book in to see me and let’s get to the bottom of your gut issues.